Director Steven Spielberg presents a masterpiece of imagination, suspense, science and cinematic magic that has quickly become the most successful film in worldwide box-office history. On a remote island, a wealthy entrepeneur secretly creates a theme park featuring living dinosaurs drawn from prehistoric D.N.A. Before opening it to the public, he invites a top paleontologist and his paleobotanist girlfriend, a renowned mathematician, and his two eager grandchildren to experience the park-and help calm anxious investors. But their visit is anything but tranquil as the prehistoric predators break out and begin stalking the island's human inhabitants. 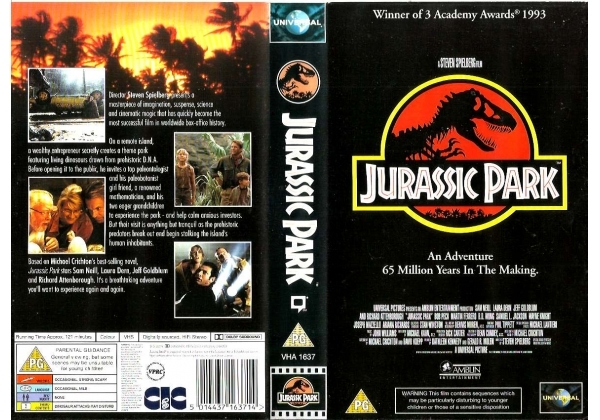 Based on Michael Crichton's best-selling novel, Jurassic Park stars Sam Neil, Laura Dern, Jeff Goldblum and Richard Attenborough. It's a breathtaking adventure you'll want to experience again and again. Or find "Jurassic Park" on VHS and DVD / BluRay at Amazon.